“By Shakespeare's time the possibilities for a politically critical drama had been transformed by the emergence of professional repertory companies which despite their residual status as royal servants derived their economic strength from a far wider public. Shakespeare's career reflects not just individual genius but the excitement of a whole collective institution at the possibilities of what amounted to a cultural revolution: the emergence of a literary public sphere which prepared the way for the formation of a political public sphere." David Norbrook, "What Cares These Roarers for the Name of the King? : Language and Utopia in The Tempest"
One of the more irritating sights in Oxfordland is the blundering pursuit of an improbable idea through fantasy thickets concocted from what they regard as evidence. These junkets always lead either to a damning assessment of Shakespeare or a conclusive addition to their so-called case for De Vere's authorship. Fox-hunting with the rear half of a pantomime horse. The unspeakable in pursuit of the unarguable. Their constant efforts to drown the evidence of Will's career in acid are intended to generate a cloud of noxious smoke to hide the crucifyingly embarrassing fact that no real evidence—of any sort—lends credence to their own case. Recently we have seen imaginary acts of usury and criminal behaviour pile up into a mountain of disreputable sharp practice and then lead to the conclusion that Shakespeare earned his cash from pimping, strong-arming, moneylending and generally impersonating Don Corleone in Elizabethan Southwark. There's plenty of detail about how Will earned his daily bread. Along with a few other inspired pioneers (it always takes more than one), Will played a significant role in inventing an entirely new industry. The "the emergence of a literary public sphere" of which Professor Norbrook speaks was made possible by the invention of one of the earliest consumer products, the first in the sphere of entertainment - the theatre ticket*. Which is exactly what the real evidence says. Of course, the hired player, even a few hired playwrights, existed long before Shakespeare. On 2 April, 1543, the Court of Aldermen in London issued an order suppressing all plays in the city because somebody had been setting up playbills on the Lord Mayor's gate 'ageynst doctour wylson & doctor weston', apparently referring to Nicholas Wilson, prebendary of Hoxton, and Hugh Weston, rector of St. Nicholas Olave. From this point onward, seven years before Oxford was born, the professional theatre and the court interlude were on separate development tracks. At court, lavish entertainments in the form of devices and interludes continued, funded from the seemingly bottomless pockets of wealthy aristocrats. In the guild halls and inn yards however, impresarios, investors, actors and writers had discovered that they no longer needed to wait for paid commissions. They could put on a show, charge an audience to watch, and make a profit—if they were careful. They could even go and play their work at court, since there was no reason that an aristocratic audience would not enjoy a good play any less than the playgoer (soon to be) on the Blackfriars omnibus. It's much harder to find examples of court interludes transferring to Bankside. Impossible, in fact. As with any new industry, learning and refining the business took time. Failure was rife. It was not until after professional theatre acquired its first permanent home when The Theatre opened in 1576 that the numbers started to come right, the relationships between the various metiers started to coalesce and the business model started to look familar to the modern eye. When young Will Shakespeare started work, however, it must have been clear that there was serious money to be made and that the owners of the playhouses were the ones taking it home by the wheelbarrow-load. In the 1980's, at the height of the venture capital industry's blind investments in technology it didn't understand, everyone was looking for generic international products. The favourite product platitude was 'we need something cheap that every bicycle owner in China will buy'—a way of saying 'make sure your product has a powerful multiplier'. The Elizabethan and Jacobean theatre had the most powerful multiplier since the days of the water-sellers in the Colosseum in Rome: a huge audience. And now, it was a paying audience. By the 1590's, it was a big paying audience. One theatre ticket* cost 1d—2d for a new play. The majority of the audience would pay a bit more, another 1d for a seat, 1d or 2d for a cushion, 6d for a private box. Perhaps another couple of coppers on nuts, ale or oranges. An Elizabethan theatre like The Curtain, in the course of a year, even if it filled only half its seats, could expect to draw in 150,000 - 300,000 paying customers. There was more than one theatre, of course. After calculating the boundaries of the Elizabethan theatre-going universe and making a few basic calculations on take-up and occupancy, even the large allowances for everything from weather to plague closure, we are looking at a very large amount of money. "£7,000/0/0d a year, Mr Fennyman". Perhaps not to the penny. The total market may have been worth considerably more, and especially so for the Jacobean theatre, where perhaps as much as £15,000 per annum was available for sharing which, as a revenue producing sector of the economy, puts it in the same order of magnitude as the tin industry, in which Oxford assiduously but unsuccessfully pursued an income. With the left fork of their tongue Oxfordians are lately keen to play up Will's business acumen. This is because it suits their quest to recognise the existence of Shakespeare the businessman, close to The Globe. With the right fork of their tongue, they then attempt to divorce him from the play-writing activity that bears his name and for which his friends, rivals, neighbours and fellow parishioners honoured him. The tactic is intended to reduce Will's income from the theatre as a percentage of his total earnings and increase his earnings from investment and money-lending. In January 1596, the same (Admiral’s) company played on every day except Sunday and presented 14 different plays. Of these six were only ever given one performance. The next month their new play, Chapman’s the Blind Beggar of Alexandria, first performed on 12 February, was followed by a play they had not performed for 140 days, Marlowe’s Dr Faustus. During the 140 days that intervened between one Faustus and next, the Admiral’s Company…played 107 performances of 21 other works. It's an attempt to support one daft idea with another, superficially less daft. They have to get that pen out of Will's hand somehow. By claiming that most of Will's income came from non-theatre activities, they hope to portray him as somewhat of an amateur, whose theatre career was secondary to his career as a financial operator, in an attempt to inch him closer to their own amateur money grubber, Edward de Vere. So they thunder through the thickets of hearsay and trawl through the small claims courts in search of a smaller Shakespeare—a canny street operator, a bro' in the Bankside hood, a pimp and a moneylender. A troublemaker. Someone who probably could patch a play but never wrote one. Someone who took money from Oxford to provide his cover. This is a smarter game than their former kindergarten conspiracy theories with which it is clearly at odds. Apostasy in fact. Consistency is always as rare as logic in the Oxfordian Game of Clones. Gone is the illiterate Shakespeare, gone is any idea that there were multiple persons using the name. Gone is the idea that everyone knew Oxford wrote the plays but kept quiet about the fact. And good riddance. Sadly, the idea still heaves and splits under the weight of its own contradictions. Oxfordian ideas can easily qualify as 'much less ridiculous than normal' whilst still being light years away from 'sensible'. This new idea, Oxfordianism Lite, posits a penniless aristocrat, invisibly acting as one of the driving forces behind the fastest growing industry in Europe—a man who, in his real, documented life, spends years of effort trying to land a small income out of the Cornish tin-mining industry yet who is secretly willing to drive the burgeoning entertainment industry without touching the vast sums of hard cash it generated. A man who was a combination of Brian Epstein and John Lennon, content to work, pretty much full-time for 20 years, for 0%. A key player who took absolutely nothing from an industry worth millions at today's values. Oxfordians pooh-pooh the figures. Pooh-pooh the potential. Point to the fact that most writers were poor. Well, of course, writers are still at the bottom of the pile today, mostly receiving a fraction of what actors get for delivering the parts that writers have created. Yet they can produce no reason why Lord Oxford would surrender significant lifetime earnings and the title of 'Father of English Drama', or explain why no one noticed what was going on, nor can they come up with any kind of modus operandi which would be practical for a hidden Earl. It's just more unsubstantiated wishful thinking. In the teeth of evidence to the contrary. There's only one William Shakespeare. And Will wasn't just a writer. And it's true that he didn't make much from writing. We know Will was an actor and a good one, we know he had a share in the Lord Chamberlain's Men, we know he became a full shareholder and housekeeper in The Globe company and a shareholder and housekeeper at The Blackfriars. We know this the same way we know professional theatre companies existed in Henry VIII's reign. Because disputes over the income streams found their way into court, where details had to be declared. We know because there is hard evidence, despite what Oxfordians claim. We know because this great new phenomenon did not go undiscussed and the early practitioners went to court with disputes over depredations to costumes as early as 1530. Arguments over legacy entitlements abounded until the principle of capitalising shares amongst existing shareholders became common in the early 1600's. We also know the market Will worked in, we know the prices paid for tickets, we know the percentage paid to shareholders, and we know roughly what lead actors and jobbing actors were paid. So we can use a nice, modern financial modelling tool, the Excel spreadsheet, to work out a rough idea of what was going on. Now, first thing to admit is that we are wrong. But hold that front page. 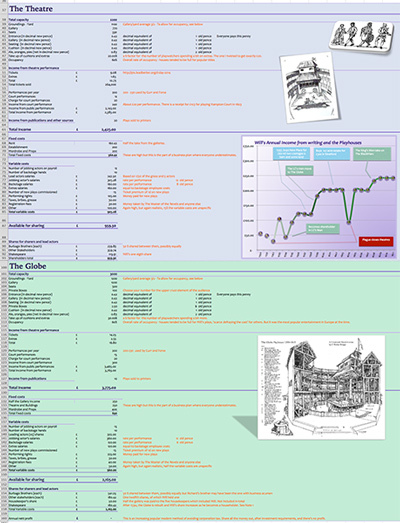 There can be no correct set of figures—financial modelling is speculation by its very definition. 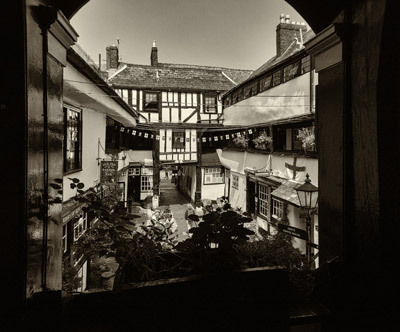 But only the black and white Oxfordian mind would leap immediately to the conclusion that it is useless to perform modern financial modelling experiments on 16c businesses. There is, however, no getting round the fact that just distance in time introduces plenty of uncertainties. Another large source of uncertainty lies in the the behaviour of industry pioneers, early adopters and entrepreneurs. This has always been depressingly consistent. They screw up. They spot a market then ruin it by trying too hard or setting unreasonable precedents that then can't be altered or aim at the wrong development objectives. There are many markets which have been screwed up just a moment after they were discovered. Others are screwed up over time or by the unexpected effects of new technology. Not only do entrepreneurs screw up, they screw up in exactly the same way again and again. They're entrepreneurs and modern society doesn't work without them. That doesn't mean we can't get into the ball park of Will's earnings. We can. There is even prior art. Schoenbaum, Gurr and Forse have all had a go. The spreadsheet below uses the what we know as formulae and all its calculations are based on variables in its premise statements. There's no hard data in the output so one set of assumptions can be swapped for an entirely different set in a few seconds. When modelling a business, like the theatre business, which relies on consumer items like theatre tickets, the key assumptions mostly concern the volumes used to create the income line. Gurr and Forse seem to be assuming that the theatres ran at 50% capacity or less. However, neither Gurr, nor Forse are entrepreneurs and they have not factored in stupidity, chaos and waste. My own projections, using the model, produce an income for Will that is lower than Gurr and Forse in places and higher in others. Gurr and Forse are happy with per-play production cost of £2. They do not include marketing costs and allow nothing for contingencies. I cannot see, based in the income figures for participants, how £2 could be realistic. Calculating performance costs based on the same assumptions as income analysis produces a much higher figure. 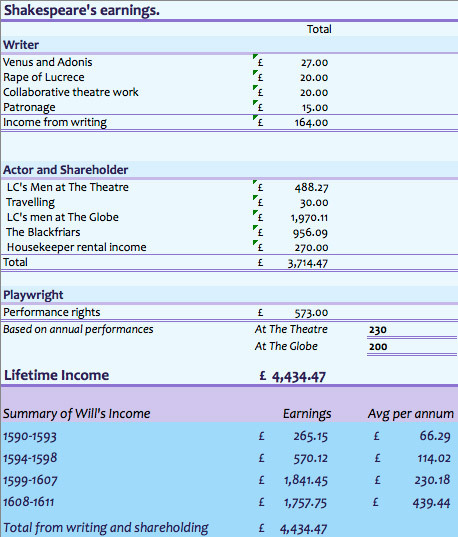 The model allows variation of acting and non-acting salaries and numbers of paid employees but even at 1/- a performance for actors and 8d for stagehands, just the salary cost of non-shareholders can exceed the £2 figure. Many of the backstage boys must have been interns. I have also assumed more waste and chaos in the early days and more professionalism in the last ten years. After all, team Burbage-Shakespeare became the top outfit of their day. We are not interested in speculating about Will's income from his investments and financial activities. Forse uses his calculations of Will's secondary financial income to advance the idea that Will may have been a full-time businessman and a part time playwright. This doesn't look possible to us and is, in any case, speculation beyond the needs of the current model. All his real investment is made in his primary business - the theatre business. Opportunity cost is the cost of the income sacrificed when doing one thing at the expense of another. Will sinks his time into the theatre. His risk is higher but his opportunity cost is lower as the theatre has multipliers which are much more powerful than those in the Elizabethan building and loan industry. The purpose of Will's land investments was most likely to have been the creation of a legacy for his family. Joint stock arrangements didn't help with legacy arrangements since they ewre designed to keep the shareholdings of deceased partners within the group, avoiding the legal complications of the shares owned by Augustine Philips. This explains why, like fellow-entrepreneur Burbage, his shareholdings would not have featured in his will. His money-lending activities are likely to have been the unwelcome consequence of large, newly-minted income streams rather than a full time sideline. We are, after all, talking about the author of The Merchant of Venice. This set of assumptions shows Will struggling as an actor and a playwright, surviving the playhouse closure in 1593 by compensating with some strong income from writing and publishing long poems. Yet despite his new line providing him with his best ever yearly total, it also reveals that he has learned where the real money is to be made. He drops patronage and poetry publishing in favour of a piece of the action as soon as the playhouses re-open. A more likely explanation, surely, than Forse's idea that he ran out of long-poem inspiration. Great decision. One of the all-time great decisions. The play's the thing to line the pockets of the king. What he opts for instead is a share in the Lord Chamberlain's Men. A couple of years later, with two-and-a-half years of shareholding income under his belt, he feels confident enough to buy the second-largest house in Stratford-upon-Avon. 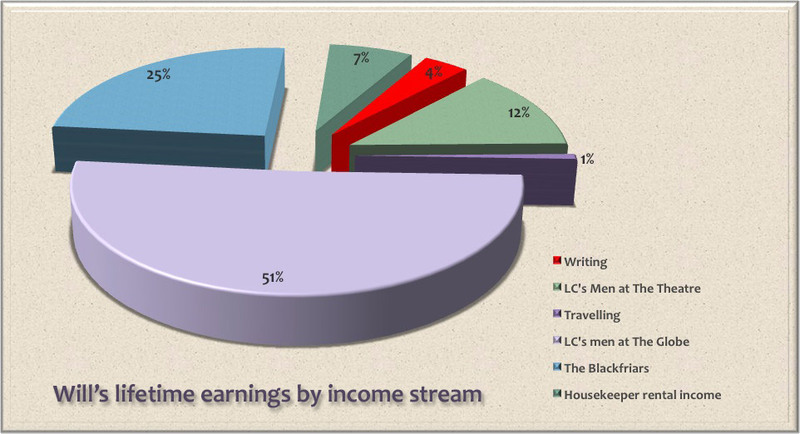 After the LC's men move to The Globe with more capacity, the income increases and Will's share increases. Again, after a couple of years at the new rate, Will makes another big investment, this time an income-producing estate in Stratford-upon-Avon. Before he retires, other investments, including that in The Blackfriars, further lift his income and trigger more investments in Warwickshire. We are really only concerned with what made him. 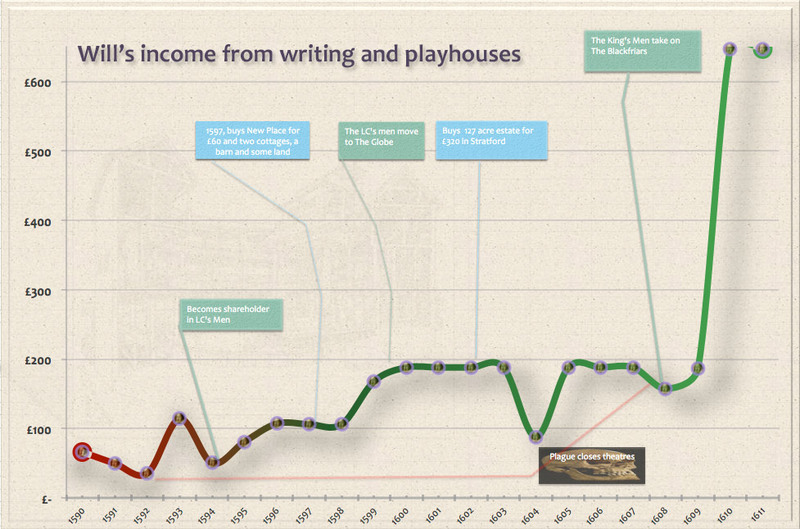 His income from the theatre up to the point he stopped writing for it. Will joins the bottom end of the burgeoning Elizabethan middle class when he becomes a writer. Initially his earnings from writing are significantly lower than his income from acting. Both are outstripped by his earnings as a shareholder. Then comes respectability. Will becomes a landholder in the provincial upper middle class and at his death is given a fine monument in the church of his childhood, where his fellow parishioners cannot fail to see him every time they walk in. It's a monument to a wordsmith, not an investment banker or grain dealer. Do the figures mean anything? Sanity is what everyone wants to see in projections. These numbers give Will an income that is consistent with what we know from the details that can be gleaned from public records and court proceedings. We should add a large pinch of liability-dodging salt: if you tried to work out Mack Sennet's earnings from his admissions in court proceedings, you would need a dose of scepticism and, probably, a large uplift. My own feeling is that given that this was a large cash business in which the customer paid 100% up front, added to the fact that they had 20 years practice to get the sums right, Will and Burbage probably did better than these figures show. Maybe quite a lot better. 50-60% occupancy would have been a poor target for the mature Globe operation. The shareholders, I think, would have learned to manage the business more astutely and may well have been doing rather better than any public records indicate. There's more than one way of getting money out of a successful, cash-rich business. I think the shareholders in The Globe and The Blackfriars would have discovered most, if not all of them. They were prepared to pay £40 a year to prevent the dilapidated Paul's theatre from re-opening, yet were smart enough to share the cost with another successful theatre group. They seemed to know what they were doing. Call Will whatever you like. Give him an income stream from pimping and money-lending if you feel you must. He may still have had to tug his forelock to the likes of Oxford but no one can deny that his involvement with the new theatre industry set him on a rapidly upward course, breaking into the upper, armigerous class of Elizabethan yuppies, who all did a great deal better than their parents by understanding multipliers and percentages. Click on the image to read a set of major assumptions. The minor assumptions adjust for seasonality, inflation, smaller initial percentages and overall growth and have been used sparingly or not at all. *Yes, we know there were no tickets. remain inaccessible until the jar was broken.